Arnald Ho, Chairman and CEO of Print-Rite, has told Recycling Times that his group of companies has settled with Canon on the recent coupling gears lawsuits in New York’s Southern District Court and the United States International Trade Commission (USITC). Print-Rite said it’s finalizing its plans for introduction of redesigned cartridges that avoid Canon’s patents, and it will inform customers as soon as the new cartridges are available for sale. Print-Rite has been awarded numerous patents for its innovations and has over 2,200 patents and pending applications worldwide and remains committed to continued investments to benefit and protect its customers. Recycling Times reported on January 29, 2014, Canon USA filed lawsuits in New York’s Southern District Court against 18 toner cartridge remanufacturers and other aftermarket suppliers. As was revealed by Canon, five Print-Rite related companies became defendants in this case, including Print-Rite Holdings Ltd, Print-Rite N.A., Inc., Print-Rite Unicorn Image Products Co., Ltd, Union Technology Int’l (M.C.O.) Co., Ltd and Innotex Precision Ltd. The OEM asserted the companies infringed patents related to its OPC drum gears of toner cartridges used in more than 50 models of Canon and Hewlett-Packard laser beam printers. Thus, Canon sought damages and injunctive relief. According to Canon, those companies have infringed its U.S. Patent Nos. 8,135,304; 8,280,278; 8,369,744; 8,433,219; 8,437,669; 8,494,411; 8,532,533; 8,565,640; and 8,630,564. At the beginning of May, Canon filed a complaint with the USITC against 33 manufacturers, distributors and sellers of toner cartridges for infringement of nine patents. Print-Rite’s five related companies were listed again. Canon claimed the companies had infringed nine of its patents (Nos. 8,135,304; 8,280,278; 8,369,744; 8,565,640; 8,630,564; 8,676,085; 8,676,090; 8,682,215; and 8,688,008); the patents related to a “dongle type rotating arm on the OPC drum used in more than 50 models of Canon and Hewlett-Packard laser beam printers”. Canon requested the Commission to issue a general exclusion order, or, at the very least, a limited exclusion order, forbidding entry into the United States of all toner cartridges and components that infringe the asserted patents. 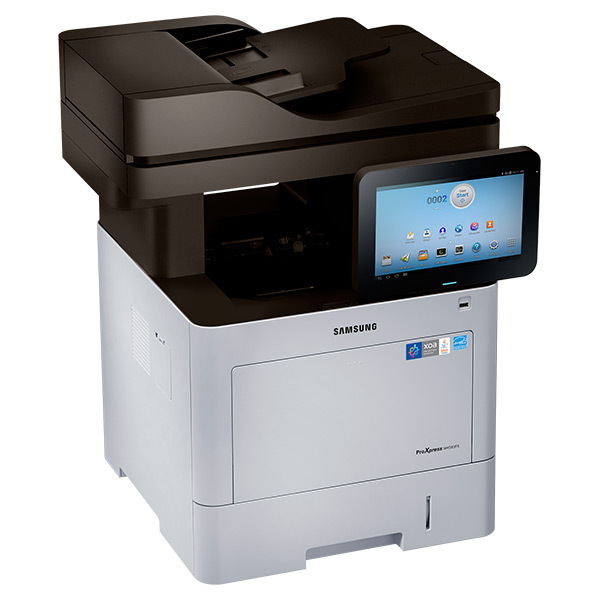 RIDGEFIELD PARK, NJ – September 2, 2014 – Samsung Electronics America, Inc. announced the C2620DW, C2670FW, M4583FX, and M4580FX, a new line of ProXpress single and multi-function printers (MFPs) designed for desktop use, but with the functionality to run an office. These powerful devices are built for small and medium-sized businesses and comfortable in the enterprise. Businesses can customize applications to meet a variety of needs with XOA while the M4583FX and M4580FX feature the new Samsung Smart User Interface (UI) powered by Android™, the first time MFPs have come equipped with an Android operating system. The M4583FX and M4580FX are built for performance with fast scanning and powerful paper handling powered by a 1GHZ dual core CPU. Both models feature quick, reliable and economically efficient printing at speeds of up to 47 ppm. A Dual Scan Document Feeder (DSDF) allows for double-sided scanning at up to 60 images per minute. Further, a long life drum supporting up to 100,000 pages and high yield toner supporting up to 40,000 pages* are designed to perform longer, resulting in a lower total cost of ownership. With the new Samsung Smart UI, along with an intuitive 10.1-inch LCD touchscreen display powered by Android, the MFPs can operate independently without a PC. Businesses can customize their printing experience with web search, quick print, and document preview functions. Both models also have an option to add wireless and active NFC capabilities, which provides users with the ability to effortlessly print files from an NFC-enabled smartphone using the Samsung Mobile Print App. The M4583FX and M4580FX feature Samsung’s XOA-Embedded platform, allowing solutions developers and businesses to greatly enhance the functionality of these machines by building custom applications for a variety of business needs. From smarter workflows to enhanced security, custom XOA solutions can modernize an office and elevate businesses to new heights of efficiency. Building on the successful line of CLP-680 series printers and CLX-6260 series MFPs, the C2620DW and C2670FW are enhanced for the modern office.Featuring Samsung’s Rendering Engine for Clean Page (ReCP) technology and polymerized toner, the printers deliver sharp vibrant prints at speeds up to 27 ppm for black & white and color. The C2620DW and C2670FW are powered by a 4.1-inch LCD touchscreen display for intuitive and easy usage. Advanced mobility features, such as native Google Drive support and built-in NFC, allows users to print files from the cloud and from NFC-enabled smartphones via the Samsung Mobile Print App. Additionally, the devices include the XOA-Web platform, allowing business to integrate server-based smart solutions to enhance the feature set and improve productivity. The cost per page has been reduced from previous models, resulting in a lower TCO and better value to businesses. BCPS is a software suite that runs on the XOA-Embedded platform and was created to improve workplace efficiency for small to medium-sized businesses. With custom workflows, secure print release, and cloud printing, IT managers can easily implement the kind of print and document management solutions typically seen in the enterprise. By installing BCPS on a M4580FX or M4583FX, businesses can connect up to five XOA-Web enabled machines, including the new C2620DW and C2670FW, which will save on costly infrastructure and servers. All four new models are Google Cloud Print and Apple AirPrint compatible, providing a universal user experience no matter how users choose to print. In addition, the Samsung Mobile Print App facilitates printing and scanning from any Android or iOS powered mobile device with any Samsung network shared printer and MFP without the need for a computer. The app can be easily downloaded to a smartphone or tablet from popular app stores such as Google Play. With its capability to print Microsoft Office documents as well as support for Job Accounting and Secure print, businesses can improve the efficiency of their increasingly mobile workforce. All Samsung printers can be found at select Samsung resellers and channel partners. Local availability can be determined by calling 1-866-SAM-4BIZ or by visiting samsung.com/business. Follow us on Twitter @SamsungBizUSA.